Powers/Abilities: Sari posesses no superhuman abilities. She was a trained, but vain actress. After losing her beauty following an unrevealed incident she was left physically and mentally scarred. Growing to hate beautiful people, her mind became very twisted. 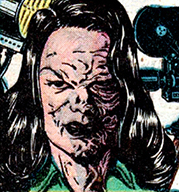 (Marvel Mystery Comics#84/2 (fb) - BTS) - Tartar was an actress famous in the 1940s for her beauty but she was permanently scarred following an unrevealed incident which ended her acting career. This turn of events caused her to grow resentful towards beautiful people. 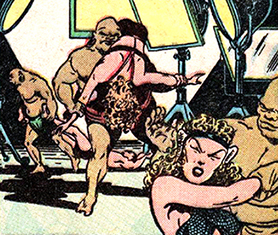 (Marvel Mystery Comics#84/2 (fb) - BTS) - Tartar turned to directing. She decided to work together with Hollywood's Goliath-Major Studios representative Stanley Gordon who wanted to make a realistic horror movie. They planned to abduct several beautiful people who they would torment on a pirateship while Tartar filmed their agony. Calling the movie in progress "Pirate Harvest" they hired several ex-cons to pose as her pirate crew and slave army who would torture the kidnapped people. (Marvel Mystery Comics#84/2 (fb) - BTS) - Tartar had already kidnapped seven beauty contest winners by the time a New York newspaper picked up on the story and published an article on the "case of the vanishing venuses". 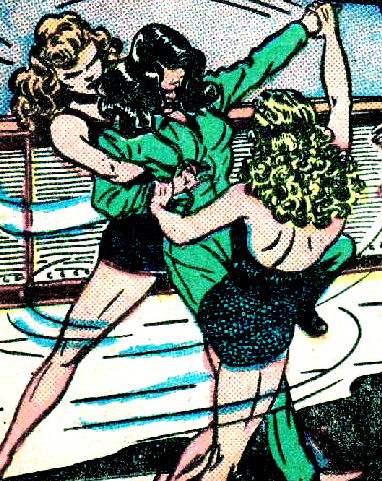 Since the police didn't seem to get anywhere in their investigation the Sub-Mariner, Namora and Betty Dean decided to help. (Marvel Mystery Comics#84/2) - Unaware he was dealing with Namor, Namora and Dean, Stanley Gordon tricked them into doing a screentest for "Pirate Harvest". He brought them to the pirateship where they were introduced to Sari Tartar. Namor remembered reading about Tartar's accident in the papers and offered his sympathies. Tartar would have none of it and gave them their scripts. She then showed them to their "set" below deck where all the captured people had been chained to the oars in the boat forcing them to row. Tartar managed to convince the heroes they were merely paper mache dolls. However, during their screentest Tartar had her slave crew attack the heroes who knocked them unconscious and also chained them to the oars. Tartar then started filming her real movie as her crew whipped and tortured the people into rowing the ship, visibly taking pleasure in their misery. Tartar had two of the girls dragged from the benches so she could personally hit them with her whip. Planning to film another torture scene with a severely weakened Namor, she had her accomplice dump a bucket of sea water on him to wake him up. Water of course revitalized the Sub-Mariner who broke free and captured Tartar with little effort. By that time, Namora and Betty had also freed themselves and even defeated Tartar's crew. They joined Namor and Tartar while the Sub-Mariner also captured Gordon. Tartar and Gordon were taken into custody by Lieutenant Byron of the United States Coast Guard. Comments: Created by Bill Everett. While I'll be the last to defend the often ludicrously restrictive Comics Code Authority, I can imagine some parents might have taken offense at a tale like this. Saw meets Hostel meets Pirates of the Carribean. Stanley Gordon was Sari Tartar's right hand man, and representative of the Goliath-Major Studios. Gordon was scouring the beaches of Florida for beautiful people who he would convince to participate in a screentest for the new Hollywood blockbuster "Pirate Harvest". He would then take them on his boat to the pirate ship where the aspiring actors would then be captured. When he encountered Namor, Namora and Betty Dean he didn't realize they were heroes and invited them to audition as well on the ship. After the heroes dealt with Sari and returned to the Florida beach they found Stanley and captured him as well. Stanley and Sari were taken into custody by Lieutenant Byron. 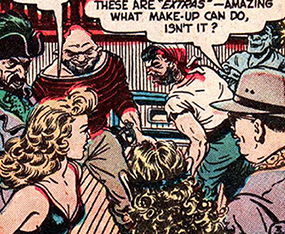 Tartar's crew was made up of a group of ex-cons who were dressed like pirates. When Betty Dean remarked she had never seen such veil-looking men in her whole life Stanley Gordon convinced her they were extras with remarkable make-up. Besides these pirates there was also a group of African men (one of them was named Giorgo) who acted as the slave crew of the pirateship, all of them spoke with thick African accents. Lieutenant Byron of the United States Coast Guard was a friend of Namor the Sub-Mariner. 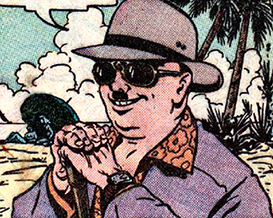 When Namor suspected movie producer Stanley Gordon was involved in a number of missing person cases he contacted Byron to patrol the Florida waters waiting for Namor's signal flare. 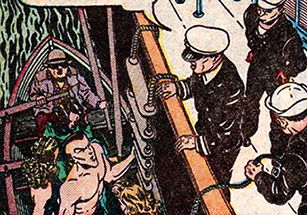 After Namor fired that signal that very night Byron and the Coast Guard made their way over to the boat and took actress-turned-criminal Sari Tartar and Stanley Gordon into custody.